Yesterday’s U.K. Parliament vote was another bump in the road for Brexit. 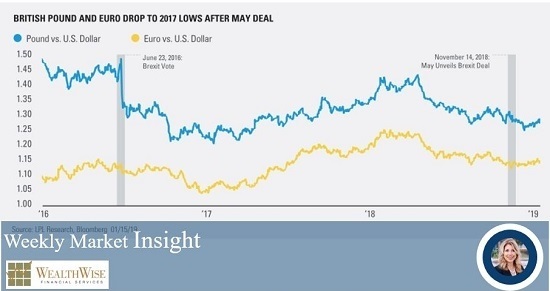 As shown in the LPL Chart of the Day, the British pound and the euro have steadily declined over the past few months, weighed down in large part by pessimism around British Prime Minister Theresa May’s proposed plan for a European Union (EU) exit (or Brexit). Market participants have been largely positioned for Parliament’s rejection of May’s deal, especially after several Brexit-related political resignations and a delayed vote. The path to a Brexit is less clear now, especially after May’s deal was struck down by more than two-thirds of Parliament and the March deadline for a deal nears. There is a growing chance that May will be ousted after such a large defeat, and Brexit’s unprecedented nature means the steps to a decision can change. Still, political volatility is nothing new for Europe, and we encourage U.S. investors to look past the headlines. “While Europe’s political woes have plagued investors over the past several years, they’ve been minor roadblocks for U.S. stocks, which have gained on the heels of a solid domestic economic expansion and accomodative monetary policy,” said LPL Research Chief Investment Strategist John Lynch. The economic implications of Brexit are tough to predict. A hard Brexit, or the U.K. leaving the EU without the two parties reaching a deal, would pose a swath of challenges in figuring out details of the arrangement, particularly on trade with the EU. Meanwhile, a negotiated Brexit would likely have fewer unintended consequences. On the surface, any hiccups in the U.K.’s economy would have a negligible impact on global output; however, global growth has been inconsistent at best in this post-financial crisis era, and sentiment around the world has weakened recently from the ongoing U.S.-China trade dispute. The U.K.’s exit from the EU could also weigh on global corporations as they adjust to new standards and rules. For now, we’re maintaining our cautious stance on Europe. As mentioned in our Outlook 2019: FUNDAMENTAL: How to Focus on What Really Matters in the Markets, we expect the gross domestic product of developed markets (excluding the U.S.) to grow at the slowest rate of all major global regions, supporting our preference for U.S. equities over developed markets (ex. U.S.) in 2019.